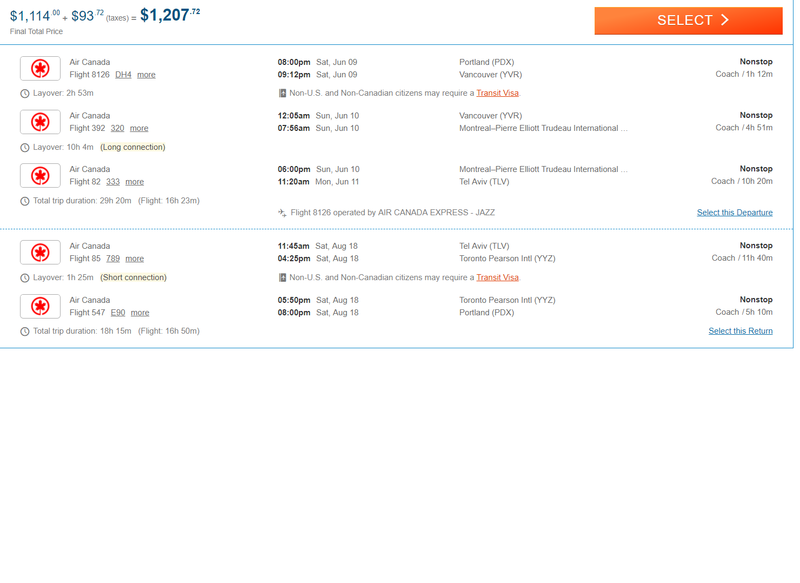 I'm traveling from PDX to TLV roundtrip from June to August this summer and ended up on some 3rd party airfare sites. I found the above fare on Cheapoair and have a few questions. Is the 1.5hr connection when returning (TLV to YYZ) possible? I'm not sure if I would have to go through immigration at that point since the flight after that is back to the USA (I have an American passport). In addition, is this fare considered to be on a single ticket? Will I have to recheck my bags at one of the steps on the way to TLV if I check them beginning at PDX? That's a doable connection, but it's tight. You'll be clearing customs and immigration twice at YYZ (Pearson, Toronto) - once for Canada, once for the US (pre-clearance). You will need to reclear security after clearing US customs and immigration. (Canada is moving at some airports to not require this after re-entering Canada, but the US so far has not followed suit.) This means if there's any delay, you'll be at risk of missing your connecting flight home. shows the minimum connection time in YYZ for "international to US" to be 1 hour and 25 minutes. So your connection is "legal" but it's right on the edge. In practices this means: if all goes well (no delays, no major lines at immigration/customs) you will make the connection. If you don't, Air Canada will rebook you on the next available flight to PDX for free. Not the answer you're looking for? Browse other questions tagged customs-and-immigration canada short-connections yyz pre-clearance or ask your own question.